Despite their small size, chia seeds are full of important nutrients! Chia seeds are a good source of omega-3 fatty acids, fiber, antioxidants, iron, and calcium. A 28-gram, or 1-ounce, serving of chia seeds also contains 5.6 grams of protein. Mixed with water, they can replace egg in vegan cooking. Chia seeds can be eaten cooked or raw, but they should be added to another food or soaked before eating. Chia seeds are rich in nutrients and fiber. Eating one ounce of chia seeds each day would provide 18 percent of daily calcium needs, 27 percent of phosphorus, 30 percent of manganese, and smaller amounts of potassium and copper. Chia seeds provide more omega-3s, calcium, phosphorus, and fiber than flaxseeds. Most people do not consume enough of these essential nutrients. Chia seeds are black in color and they have a mild, nutty flavor. Raw, they can be sprinkled on cereal, yogurt, oatmeal, or smoothies. They can also be eaten cooked, added to baked goods like bread and muffins. In vegan baking, they can replace eggs. To use them as an egg substitute in baking, try mixing 1 tablespoon of chia seeds with 3 tablespoons of water, then let them sit for a few minutes. A gel will form that can be used instead of eggs in baking. There is evidence that chia seeds were first used as a food as early as 3500 B.C., and served as a cash crop in central Mexico between 1500 and 900 B.C. Chia seeds were eaten as a grain alone or mixed with other grains, drank as a beverage when placed in water, ground into flour, included in medicines, and pressed for oil and used as a base for face and body paints. Aztec rulers received chia seeds as an annual tribute from conquered nations, and the seeds were offered to the gods during religious ceremonies. Chia was one of the main dietary components of not only the Aztecs, but also of another great Pre-Columbian civilization that developed in Mesoamerica, the Mayans. The Mexican State of Chiapas, located within the limits of what was ancient Mayan territory, derives its name from the Nahuatl word Chiapan which means “river of chia”. This indicates that existence of chia as a crop in this region also extends from very early times. The conquest of America repressed the natives, suppressed their traditions, and destroyed much of the intensive agricultural production system that was in place. Many crops that had held a major role in Pre-Columbian American diets were banned by the Spanish because of their close association with religion, and were replaced by foreign species (wheat, barley, carrots, etc) which were in demand in Europe. In recent years chia seeds were only consumed by small groups of people. Primarily they were mixed in water, along with lemon juice and sugar, and consumed as a refreshing beverage in Mexico, Guatemala and Nicaragua as well as the southern USA (California and Arizona). It is interesting to note that 500 years later, modern science has concluded that Pre-Columbian diets were superior to present day diets. Formerly forced into obscurity, chia seeds are now emerging as a new food, and offer a great opportunity to improve human nutrition by providing a natural source of omega-3 fatty acids, antioxidants and dietary fiber. September and October 2018 Special Sale! All our chia seeds are sourced and approved by Dr. Wayne Coates, the Father of Chia Seeds! Dr. Wu: I use this chia seeds myself, 2 tablespoons every morning for 8 years to help my skin become smoother. I tried all top 10 food companies' chia seed products. They cost more then $22 per pound. None of them worked for me. Chia bia is the only brand that works for me. 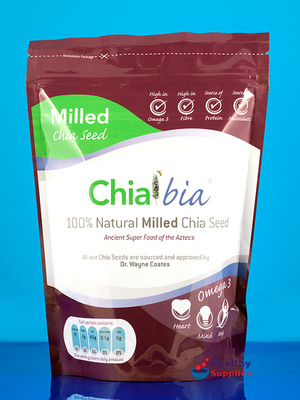 Chia bia is the best chia seed in the market!